Drama/Comedy, West Germany/Austria, 2016, 162 min. Synopsis TONI ERDMANN (Peter Simonischek) is Winfried, 65, a music teacher with a strong penchant for jokes, who lives with his old dog. His daughter Ines (Sandra Hüller) is a career woman who travels around the world in order to optimize companies. Father and daughter could therefore not be more different. He, the soulful, socially romantic '68. She, the rational management consultant who tries to raise her profile at a major outsourcing project in Romania to compete in a mans world.Winfried does not see much of his daughter at home, he decides after the death of his dog to visit her spontaneously. But the visit does not lead to a rapprochement. Winfried annoys his daughter with mild jokes and subliminal criticism of their performance-oriented life between meetings, hotel bars and countless emails. 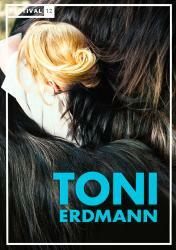 Father and daughter at an impasse and it comes to a confrontation between the two.But instead, as announced to leave Bucharest, he surprised Ines with a radical transformation in Toni Erdmann, his dazzling alter ego. With crooked teeth, bad suit and wig Toni is wilder and bolder than Winfried and does not mince his words. Toni mixes in Ines professional life, to be with the assertion that the coach of her boss and start a rampage of jokes. Surprisingly leaves Ines on his offer, and father and daughter making a startling discovery: The harder they clashed, the closer they come.